An “Eco Pavers” system is a structure of patio paving stones with a base made specifically for more environmentally friendly drainage than a typical paver patio. The best thing about an eco- paving system is that it doesn’t sacrifice beauty for function. Buyers are thrilled with their new home but are left with more questions than answers when it comes to wanting to build both a new patio and garage behind it. It's a shock to find planned renovations can't be completed due to impervious surface limitations. Municipal regulations meant to protect the environment and the town’s water supply often inadvertently stymie outdoor additions and improvements. Some solutions offered, like gravel driveways or demolition of sheds, aren't very appealing. A patio that can allow rainwater to seep through to the earth below could be the answer. An “Eco Pavers” system is a structure of patio paving stones with a base made specifically for more environmentally friendly drainage than a typical paver patio. The best thing about an eco- paving system is that it doesn’t sacrifice beauty for function. 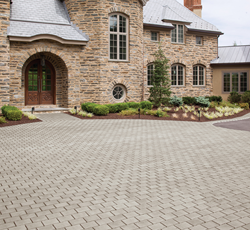 “In fact,” says Marketing Director Marianne Anzaldo of Woodbury, New Jersey stone manufacturer EP Henry, “a well-designed ECO Paver patio or driveway can allow hundreds of inches of rainwater per hour to run through it.” Ms. Anzaldo says Eco Pavers are specially manufactured with wider spacing so the water can readily run through the spaces, directing the rainwater where it should go – into the ground and not overflowing into the municipal drainage systems. Running into roadblocks when doing a patio remodel or a garage addition is par for the course. Impervious surface regulations aren't familiar territory to many homeowners, but the rules are standard in many municipalities. An experienced contractor will know the right measurements of allowable impervious areas in the particular municipality and will be able to inform the homeowner about the options. An eco-paving system is an easy, durable and beautiful way to help solve the impervious surface problem while adding to the home’s hardscape. EP Henry provides the highest quality and broadest product offerings in Hardscaping™. A Permeable Interlocking Concrete Pavement system by EP Henry with ECO Permeable Pavers are part of a system which includes 6-10" minimum of a larger aggregate sub-base and a 1-2" bedding layer of crushed stone (#8). No sand is used. ASTM test methods show our ECO Pavers take on stormwater at a rate of 577" per hour. EP Henry is 100% American made, owned, and operated. From humble beginnings in Edward P. Henry's Woodbury, NJ basement, EP Henry has evolved into the recognized industry leader in paver product innovation. For more information or a complimentary Idea Book, visit EPHenry.com or call 800-44-HENRY (800-444-3679).